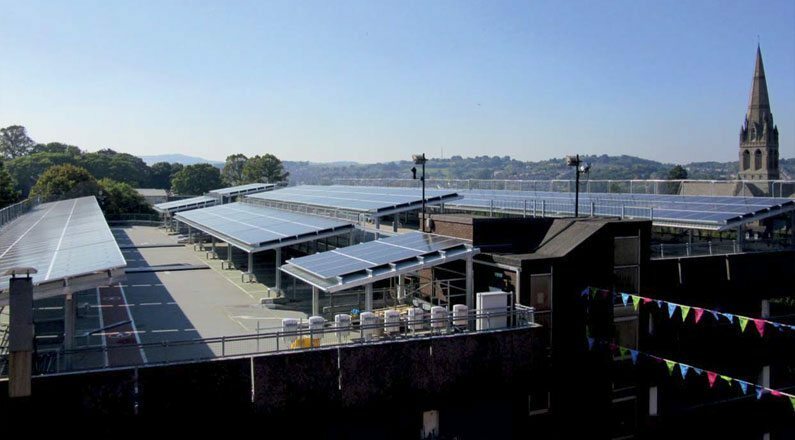 When Exeter City Council was looking for a solar solution on two of it’s car park roofs, its key requirements were to maintain car parking spaces, keep members of the public happy, preserve parking revenue and generate a significant amount of renewable energy. SunGift’s design and installation team responded to this by providing bespoke ‘solar carports’ that were not only one of its most technically-challenging project’s to date, but also broke new ground nationally. Cited on the top decks of Mary Archers and John Lewis car parks, the two 150kW systems generate almost 300,000kWh of electricity per year, save more than 150 tonnes of Co2 per year and allow customers to park undercover, rather than ‘out in the open’. In addition to commercial car park, SunGift has also installed smaller single or double bay car ports for residential use.